And of course, they all have bacon in them! These egg rolls were very easy and so incredibly good if I must say so myself. These will definitely be on our Super Bowl party menu, which we have decided will be a "Mexican Fiesta" theme! I'm so excited to snack on Mexican food all weekend! Since I'm not sure if my egg roll wrapping instructions are any good, I've included some step by step photos to help you out! I hope this shows you how easy these really are to make...so you will give them a try. Preheat oven to 400 degrees. Spray a non-stick baking sheet with cooking spray. In a bowl, combine cream cheese, shredded cheese, diced jalapenos, sliced green onions, crumbled bacon, and spices. Stir well to combine. Beat an egg with 1 T water to make an egg wash. Take an egg roll wrapper and place it on a work surface on the diagonal. Brush all 4 edges with egg wash. Use about 1-2 Tablespoons (depending on how big you want to make them) of jalapeno cheese mixture and place it in the center of egg roll wrapper. Roll up the lower corner around the mixture, fold in the left side, fold in the right side, and roll it over to the top corner. Lay them seam side down on prepared baking sheet. Brush the tops with egg wash and sprinkle with garlic powder and finely shredded cheese. See photo tutorial below. Bake for 12-14 minutes, or until light golden brown and crispy. Be careful as you don't want your cheese to burn. Serve these up with some Ranch or Ranch/Wing Sauce dip. Enjoy! These sound fabulous! 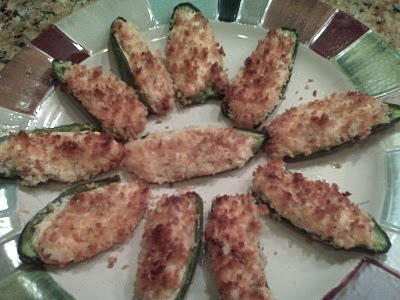 I might be making some of these babies for the Superbowl! Oh these sound great too!! Perfect for game day! These are all such creative recipes and include one of my favorite ingredients - jalapenos! I used to be afraid of spice, but how can you be when there are so many fun things to do with the little green guys? Thanks for sharing and always stopping by my blog, Rhondi! Your support is much appreciated. Yum! I love all poppers but these popper egg rolls have me drooling. Yummy! Looks like all my favorite things rolled up in one!! I want to try these sometime!! Come link up to Tailgating Time. This looks terrific and is so unique. Thanks for linking to This Weeks Cravings. These look SUPER GOOD! As a matter of fact I'm going to make some on friday, however I wanted to know could you fry them as well? Yes, they would be great fried.